Personal Empowerment Product You'll EVER Need...Literally!! awareness and understanding, your entire life. DelfinWorld provides the serious student of transformation with the life changing education, the transformational tools, and an unparalleled depth of knowledge, wisdom and practical application skills to create "Real Wealth and Harmony" that enables and empowers YOU to excel and achieve massive success in EVERY area of your life! The Delfin Knowledge System Trilogy is not a casual and all too common collection of shallow and superficial "feel good" information. It is considered by tens of thousands of students from around the world...from ALL walks of life, to be a "Total Transformation System." The Delfin Knowledge System Trilogy was created specifically for the serious student of transformation...for those who truly desire to be, do and have more in the physical, financial, relational, emotional and/or spiritual aspects of their lives. The education provided in The Delfin Knowledge System Trilogy is bar none the most comprehensive personal empowerment system ever created and delves deeply into the heart of the often overlooked aspects of life and the often misunderstood creative process. The Delfin Knowledge System clearly reveals how the various events, conditions and circumstances in each and every area of your life unfold and provides you with the practical application techniques necessary for effectively utilizing that understanding to consciously and consistently produce desired results whether physically, financially, relationally, emotionally and/or spiritually. The Delfin Knowledge System Trilogy reveals the immutable and unwavering yet often misunderstood process of creation enabling and empowering those who choose to internalize and apply the wisdom shared with an uncommon advantage that is only realized by those who choose to discover, understand and "consciously utilize" the tools you already possess to experience total transcendence and transformation. The Delfin Knowledge System Trilogy is for those who truly desire to discover where "True Wealth and Power" is found and guides the student to explore and discover the process where so few choose to look. The Delfin Knowledge System clearly reveals the often overlooked, underutilized and unwavering process which keeps so many from personally experiencing the harmony and fulfillment that is and always has been available to anyone who chooses to "seek it out", apply the wisdom gained and experience it for themselves. The transformational education provided directs and guides you step by step to explore, discover and understand that you, being provided with an inalienable right of free will have the capability to consciously and consistently mold and shape the various events, conditions and circumstances that collectively make up your physical experiences in life. You'll be challenged to look for and discover your answers where the vast majority choose NOT to look and become keenly aware that your "True Power" can never be tapped into and fully experienced through choosing an outside in approach to life. The Delfin Knowledge System Trilogy is bar none the most in depth, informative, enlightening, empowering and Life Enhancing Total Transformation System ever released to the public. The components which make up the Delfin Knowledge System Trilogy consist of 3 self study/personal empowerment modules, each specifically designed to enlighten, enable and empower you to begin consciously, intentionally and consistently moving toward whatever individually held hopes, dreams and desires you might aspire to create for yourself. The Initiation, The Journey and The Quest are delivered in both MP3 and text format and consist of the most profound, empowering and life changing knowledge and wisdom that you will find with regard to life transformation and enhancing quality of life. The Initiation is an introduction to the philosophies and principles of DELFIN Knowledge System™. It will enable you to take control over your physical, mental, emotional, and spiritual well being and destiny. Become a creator of circumstances of your life instead of remaining in the common condition of most of mankind, which is being a creature of circumstance. It is your personal guide to achieving personal wisdom and discovering your life's purpose. This self-study course provides a practical approach to achieving success in all areas of life. It consists of a 282 page book and ten companion compact discs. The Journey explains that life is a process....a journey. Each of the twelve chapters contain perspectives and techniques which empower you to decide for yourself who you are, where you are at this moment, why you are here, and to what purpose you journey through life. Once you have a clear understanding of those important questions you will achieve the clarity, motivation and inspiration to be an active and joyous participant in your personal journey. The application of your own awareness creates your own road map to success and happiness. The inviting application exercises set the stage for whole brain integration of the information. The techniques used from these applications can be utilized in your daily activities to enhance exposure to new circumstances or information. The opportunities to explore your playful, creative nature provided by the games and interactive activities will leave you smiling and reflecting on the activities long after completion. This second volume of the DELFIN Knowledge System™ consists of a book and four companion compact discs. The Quest is a personal empowerment program that is specifically written for those individuals who are consciously on a journey toward enlightenment. The Quest is not a casual or introductory self-help program; rather, it is a course for serious students of metaphysics. This is your instruction manual for achieving a transcendent or cosmic consciousness; a map to the transmutation of the human creature. The course includes four audio CDs with unique state of the art Phi-frequency Holographic Dimensional Harmonic recording technology. These recordings will assist you to achieve not only Alpha, but Theta and Delta States of meditation to bring you to your true place of power and creativity. The 218-page text contains the intellectual information necessary to convince the rational aspect of your mind of the validity of the focus of awareness called transcendent consciousness. It deals with the nature of reality, creation, and transmutation. It contains the keys you will need to unlock your potential to become the master of your own destiny -- to be able to define your own reality, to create your own happiness and fulfillment, to transform into what you have been designed to become. The DELFINWorld Personal Empowerment Platform consists of state of the art WEB 2.0 technology, providing members with an ongoing and continuously updated personal development system and personalized communication with DelfinWorld founder Leslie Fieger. Based on Leslie's 15-year study of Charles Haanel's Master Key System, the DelfinWorld System which consists of the world renown Delfin Knowledge System Trilogy as well as the DelfinWorld web 2.0 personal empowerment platform will enable you to understand the cause of all effects and interact with like minded seekers from around the globe further empowering you to become a conscious creator of the events and circumstances of your life. DelfinWorld's founder Leslie Fieger had intended to create something special and unique; something that would prove to be empowering beyond anything else that had ever been done before. Even with those high hopes, he found that he was unprepared for the results. This unique material in this super learning format has proven to be so transformative for the DelfinWorld members and has created success stories beyond what he could have possibly imagined or dared hope for that even the high expectations initially envisioned were far surpassed. We are so excited to now be able to offer to everyone easy and affordable access to what had previously been available to only those few who could afford the time and expense of attending DelfinWorld's live seminars. The DelfinWorld "Pay It Forward"
By becoming a student of the Delfin Knowledge System Trilogy, Delfin Worldwide enables you to "pay it forward" and put your newfound power to use by providing you with an extremely lucrative affiliate opportunity to both "pay it forward" and "spread the good news" about the Delfin Knowledge System Trilogy, DelfinWorld's Personal Empowerment Platform and earn substantial revenue for doing so. Self Improvement / Personal Development / Self Help Material. The Delfin Knowledge System Trilogy...If properly utilized AND APPLIED will change the entire course of your life and introduce you to an uncommon depth of knowledge concerning yourself as well as your individual abilities to consciously and consistently create and experience a life of purpose, deeper meaning, fulfillment, prosperity and TRUE WEALTH that VERY FEW are aware is available to them. ...more with regard to yourself and the unrealized power you already hold to be, do and have more of the things that you hold dear than the vast majority conceive or "perceive" as being "possible or logical." ...little known or understood laws which when grasped, aligned with and properly applied and harmonized with will enable and empower you to become a conscious and deliberate creator of your day to day experiences in EVERY aspect of your life. ...how and why your thoughts, feelings, and emotions are Directly Responsible for the outcomes in EVERY aspect of your life and how to "consciously and consistently" shift them to begin producing "Desired" results. ...how you can immediately begin to "consciously create" more money, more vibrant and radiant health, harmonious and fulfilling relationships, or Whatever else you may desire to be, do or have. ...The Delfin Knowledge System Trilogy will shatter and shift your self limiting paradigms forever!! If you answered ANY of those questions with a resounding YES take heart, because you are not alone. In fact, you are no different than 99% of the world's population. Regardless of where you may currently find yourself in life, the level of success (or lack of) that you feel you may have reached, EVERYONE wants more of something. More money, more health, more fulfilling rewarding relationships, more ??? Wanting more is a totally natural and commendable human trait. If you find yourself stuck within the mindset of the mass majority, you believe that in order to attain and "Have" this more that you desire that you must "Do" more to get whatever it might be. As a result you may choose to work more hours, take a second job, or somehow put forth more physical effort to attain it, and allow other important areas of life to be neglected as a result. Or you may even choose to believe that you just can't have it, so what's the use. Acquire the level of self awareness regarding who and what you "truly" are which enables you to shift from a "poverty consciousness" to a "wealth consciousness" and at the same time serves as the rock solid foundation which is absolutely essential to build upon to begin consciously, intentionally and consistently acquiring and experiencing "Real Wealth" in your life. I'm here to share with you based on many years of personal experience that doing and trying really hard in and of itself is a very limited and futile way to achieve long term sustainable results. While "Doing" can, will and does often produce mediocre and temporary external results, without the correct mindset, it isn't without much struggle, effort, and unnecessary sacrificing in other important areas of life, that these limited and temporary results are realized. Many develop the belief that as a result of these limited and temporary results, if any at all are achieved, that they must somehow be flawed. They begin to believe that something is wrong with them, that the timing wasn't right, that the cards must be stacked against them, that it must be "fate", yada, yada, yada. The "Real Truth" is that there is NOTHING wrong with you, it is only the way that you have been taught and conditioned to "believe"...the ways in which you have been shown to achieve these results which is flawed. Less than desired outcomes in life are based on and due to the quality of consciousness and beliefs established which, in the vast majority of cases can and do only produce very limited results...hard earned results. As a result of this "flawed conditioning" or programming it can seem difficult or in many cases impossible to achieve what you most desire to achieve REGARDLESS of how hard you may "Try" through physical effort. There is a MUCH better, simpler, and far more fulfilling and rewarding manner to begin fulfilling your most heartfelt dreams and desires which will produce LONG TERM sustainable results, with FAR LESS effort than what you have been conditioned to believe that it takes to achieve it. It's As Simple As Changing Your "Quality of Consciousness" and "Shifting Your Paradigms"
I know that this may sound "pie in the sky" or "far fetched" based on the "mindset" held by the vast majority, but the indisputable fact is YOU CAN achieve far greater results in life than what you have previously experienced once you have the "proper understanding" of how to do so and are provided the proper tools and processes for overwriting the "Subconscious" and often overlooked processes and cycles which only serve to keep so many in today's world "unnecessarily stuck." It is only due to a limited understanding and flawed "perception" of reality which makes your life and your circumstances "appear" to be limited, chaotic, random and perceived as being difficult (or in a number of cases impossible) to achieve whatever it might be that you desire. So how do you break this destructive, limiting and self sacrificing pattern? Not MORE from an external perspective, like working harder or longer, or doing things that you dislike to do, but "Becoming MORE" on the "Inside." Although many eventually do discover and reach this crossroad and come to this undeniable realization, they attempt to develop this "Inner Growth" through traditional self improvement / personal development products, many times experiencing "Temporary" results at best only to find themselves, after a short while, slipping right back into the same old destructive patterns and as a result experiencing the same disappointing results over and over again. Because traditional self help / self improvement programs fail to address the underlying cause, one of which are the deeply embedded subconscious patterns which you are more than likely not even consciously aware of. Addressing and re-patterning these instilled self limiting patterns are absolutely essential to realize and address prior to experiencing "Long Term" sustainable results. With traditional self help / personal development programs, although you may experience temporary bursts of motivation and become inspired to accomplish some task or specific goal, at some point these deeply embedded subconscious processes take back over and override the conscious choice you've made to better yourself, and you find yourself right back in the same situation that you began with. The conclusion that many come to as a result is that "This Stuff Doesn't Work" or "Something Must Be Wrong With Me." Rest assured you already have anything and everything you could ever need to achieve whatever heartfelt and individually held hopes, dreams, goals and visions you might aspire to create and experience for yourself. It simply requires developing the "correct understanding" and applying that understanding in the proper order to break and move through the seemingly inescapable cycles and "perceived" barriers that so many "perceive and believe" themselves to be trapped within and limited by. It is as simple and complex as reprogramming your navigation system. Your brain is much like a navigation system. If the wrong information or data is programmed in, it becomes impossible to reach your intended destination regardless of how hard you may "try." Your mind, more specifically your "subconscious mind" is quite literally the navigation device that determines what outcomes you'll experience in your life. If the data inputted into the system is flawed, regardless of how much you may desire something for your life, it cannot carry you to that destination REGARDLESS of how hard you may hope, wish, pray and TRY to initiate and create the "desired" change. Most of this data is programmed into you at some time in the past, unfortunately much of it flawed, which creates your internal map of reality or what you believe to be true with regard to yourself and your abilities. Many times what you have accepted and established as truth based on these teachings really isn't true at all, but rather form YOUR "individual perceptions" of truth. Later in life as you try to better yourself, it is this "internally programmed map of reality" that keeps you from achieving what you now truly do desire to accomplish. The reason that it is difficult or seemingly impossible to you is that your subconscious is far stronger than your conscious mind and as a result blocks and keeps you from fulfilling what you most desire to have and/or experience. Although it may appear complex, difficult to understand, and impossible to correct, with the proper knowledge and tools YOU CAN and WILL break through those blocks and begin to experience the results in life that you most desire to experience, regardless of how big, far fetched or impossible they may currently appear to you. Deeper meaning, fulfillment and lasting happiness? You CAN...when YOU make the choice to do so!! If you have a sincere desire to accomplish ANYTHING in life regardless of how BIG or impossible it may seem to you at this point, with that desire also comes your personal ability as well as the responsibility to achieve it. Many times these desires are written off as unattainable, or "wishful thinking" and as a result are carried throughout life, never being fulfilled. Other times honest and genuine attempts are made to fulfill these dreams and desires but due to a "flawed map of reality" that isn't in alignment with the fulfillment of those desires negates the manifestation of them and as a result, new beliefs are established or previous self limiting beliefs are solidified and only serve to reinforce the beliefs and perceptions held which say you "can't have" or "shouldn't have" whatever the desired outcome might be. The result of those solidified beliefs, regardless of how "untrue" they are is that you are absolutely correct...you get to be right. Unless and until you take "conscious control" choose to accept responsibility and establish a quality of "Consciousness" that harmonizes with those desires they will continue to elude you. You have been given and are experiencing your desires for a very specific purpose and not only is it your birthright to achieve and experience them it is your obligation. Contrary to what many have been taught, your desires, regardless of what they might be or how BIG they may seem are NOT just "Wishful Thinking"..."Far Fetched" or any other number of labels placed on them by the unaware unless and until YOU choose for them to be. Your desires exist as a result of an inner calling and YOU DO have the ability as well as the potential to fulfill them. Yes, you may need to do a little internal housework, but once that has been properly addressed those desires which at one time may have seemed impossible to reach become amazingly easy to attain. If you have a sincere desire to accomplish something but to this point haven't been successful in making it a reality, it isn't because it wasn't meant to be or due to wishful thinking or any other reason that may come to mind. It is merely because you don't have the proper knowledge, system, beliefs, and/or the understanding of the necessary components to make it a reality. The Delfin Knowledge System Trilogy provides EVERY component necessary and presents it through a whole brain learning approach that addresses EVERY issue that has limited your results in the past and provides EVERYTHING you need to initiate the subconscious Inner Change necessary to break through even the most seemingly impossible blocks and barriers enabling you to become the "Conscious Creator" that you desire to become. You TRULY ARE a creator of your circumstances. Unfortunately if your like most you're "Unconsciously" creating those circumstances and as a result creating more of what it is that you claim that you don't want. What do you have a sincere desire to achieve? The Ability To Do What You Want When You Want? The Delfin Knowledge System Trilogy is a state of the art Transformation System which utilizes whole brain learning techniques which enhance your ability to tap into and integrate both right and left hemispheres of the brain allowing you to not only absorb and retain the necessary components of success but to retain what you discover long term at the subconscious level. In essence The Delfin Knowledge System Trilogy overwrites the self limiting, self sabotaging patterns and beliefs that you may hold regarding yourself and your abilities and replaces them with "Truly empowering" and productive patterns enabling you to achieve ANYTHING that you desire. The Delfin Knowledge System Trilogy provides vital information that is missing in our traditional education systems and which traditional self improvement / personal development programs fail to address. The Delfin Knowledge System includes a profound, eye opening and self empowering educational system that has been personally responsible for producing massive transformation in the lives of tens of thousands around the world, and is responsible for empowering individuals from all walks of life, regardless of formal education to begin experiencing the lives that at one time were "perceived" as being nothing more than a figment of their imagination. In addition, for those with a desire to "spread the good news", DelfinWorld provides YOU with the unparalleled affiliate opportunity to share this life changing information with those who you encounter and provides significant financial rewards for doing so. What Sets DelfinWorld and The Delfin Knowledge System Trilogy Apart From Other Self Help Products? The DelfinWorld products, known as The Delfin Knowledge System Trilogy and The DelfinWorld Personal Empowerment Platform consist of and integrate an exclusive, life changing, and cutting edge life enhancement educational product known as The Delfin Knowledge System (The Trilogy) and combines it with ongoing education, support. The Delfin Knowledge System Trilogy not only provides you with a profoundly in depth and empowering understanding of the underlying process of creation but also the know-how and specific step by step guidance enabling you to begin moving immediately forward toward achieving personal, business and financial success. 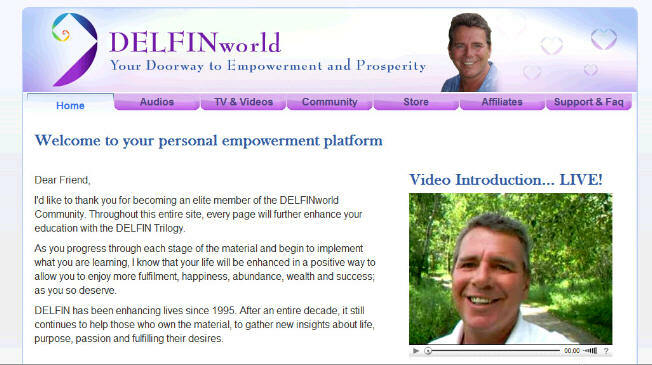 DelfinWorld goes one step further and provides ongoing education and personal empowerment tools in a multi-media format consisting of live coahing with DelfinWorld founder Leslie Fieger via DelfinWorld TV, continuously updated video coaching lessons and an ever growing archive of personal empowerment articles specifically designed to empower and teach you to accomplish whatever you choose to accomplish in any area of your life. The Delfin Knowledge System combined with DelfinWorld's Personal Empoweremnt Platform is NOT a traditional self help / personal development program but rather a Total Life Transformation System which delves deeply into the core of how the various events, conditions and circumstances in life unfold as they do enabling you to develop the necessary awareness, knowledge, direct application techniques and proper implementation of those techniques which enable and empower you to become a "Conscious Creator" in EVERY aspect of your life. The Delfin Knowledge System Trilogy in and of itself has been credited with and proven to transform tens of thousands of lives for people from all walks of life around the world. The Delfin Knowledge System Trilogy is NOT your typical education! Clearly see, perhaps for the very first time, that YOU are creating the conditions which make up your life. Yet the vast majority are doing so unconsciously. Finally understand how it is that the events, conditions, and circumstances which make up your life experience happen as they do and why many of the results that you are currently experiencing aren't what you desire to experience. Establish A Firm Understanding and Unshakable Belief In Those Processes Enabling You To Align and Harmonize Your Actions With Their Inevitable And Unwavering Operation To Create Desired Results In EVERY Area Of Your Life. Provide You With The Ability To Eliminate The Current Perceptions And Beliefs That You Hold Which Are Directly Responsible For Limiting Your Results. Provide You With The Necessary Wisdom, Tools and Step By Step Direction That Allow You To Become A "Conscious Creator" Which Enables You To Experience Desired Results. The Delfin Knowledge System Trilogy is A Total Transformation System that allows you to not only develop the necessary understanding from a place of deep inner knowing, but through this deeper understanding enables you to form the necessary "Belief" or "Faith" to achieve ANYTHING that you have a sincere desire to accomplish as well as the clearly charted step by step plan to empower you to begin "Consciously" utilizing that knowledge to produce pleasing and "Profound" results. Break Through The "Perceived" Blocks and Barriers Empowering You To Finally Experience A Sense Of Assurance, Unshakable Belief, Faith, and "Inner Knowing"
Physically, Relationally, Emotionally, Spiritually, and Monetarily. If you are finally ready to take "Conscious Control" and transform EVERY aspect of your life...to begin experiencing all that life has to offer, The Delfin Knowledge System Trilogy and The DelfinWorld Personal Empowerment Platform provides the vehicle that can and will take you there. Now it simply dependent on your choice to take it for a test drive and prove it to yourself. Regardless of how many self improvement / personal development products you may have tried in the past, you have discovered the last program you will ever need to make EVERY hope, dream, vision, and goal a very real and lasting part of your life. Discover for yourself the Magic and Life Changing Power of The Delfin Knowledge System Trilogy. Total Transformation Is Only A Choice Away. Should you decide that you're ready...you'll soon discover that your life is about to change, dramatically and permanently. The DelfinWorld Personal Empowerment Platform recommended in the Delfin Knowledge System Trilogy article and throughout Abundance-and-Happiness.com has been personally tested and approved by the founder as a credible and effective means of accomplishing it's intended purpose. Any and all guarantees expressed or implied are handled through DelfinWorld who provides the resource. Copyright © 2005-2012, Abundance-and-Happiness.com The Delfin Knowledge System Article and all content on Abundance-and-Happiness.com is strictly prohibited without the express written consent of the author. All Rights Reserved Worldwide.